There's no doubt that all the main characters of the movie "The Descendants" have a pretty intense background. Your first clue? The name of the movie, right off the bat whether or not you're familiar with the plot you know that the characters have to be people of unusual lineage. But who would have thought the sea witch, Ursula, would have borne such cool offspring? Hmm, actually, with Ursula's salty personality and chic seafaring style we shouldn't be that surprised that the sea queen raised a daughter who drives a hard bargain. On the Island of the Lost, Uma rules the roost especially her mom's fish and chip shop. She has no trouble gathering her pirate crew together. She knows what she wants and she knows how to get it. If she has to kidnap the "goody-two-shoes" boyfriend of an enemy? So be it, that's the art of the deal, that and great fashion sense. Her ensemble has gorgeous details from every angle. 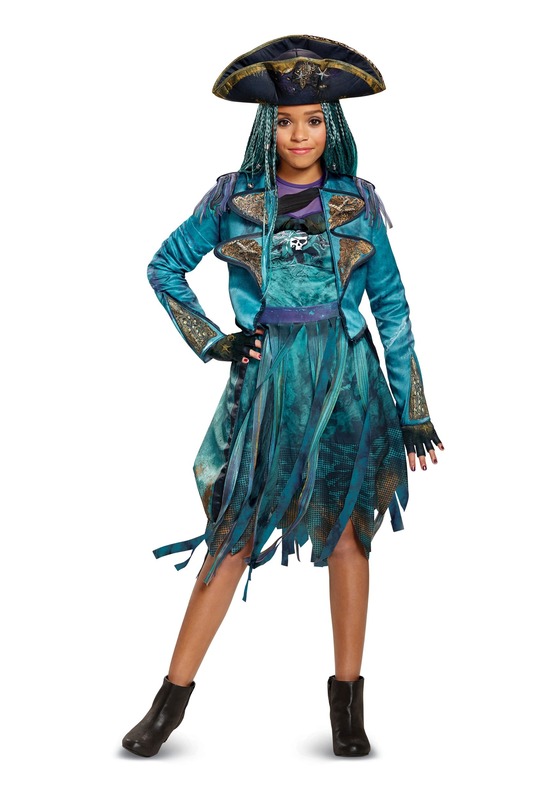 The teal jacket has a sea washed look with golden skulls, sea shells, and other nautical pieces arranged on the skirt. The back of the dress has a sheer purple inset around the shoulders, printed gold studs along the tip, and fringe on the shoulders for the naval look. With this costume, getting that cool Uma look isn't hard. Although, getting her salty attitude down can be a challenge, depending on your child. To finish the look off, don't be shy about piling on those bracelets and rings over her sweet cutoff gloves. Then, when she's challenging people to arm wrestle she'll look truly authentic but we know there's no hiding who she truly is. In the words of Uma herself, "You can stick a tiara on a villain but she's still a villain."